Strategically placed right at the heart of Kota Kinabalu, our Hotel is just within footsteps to major attractions and joints beloved by locals and visitors alike. 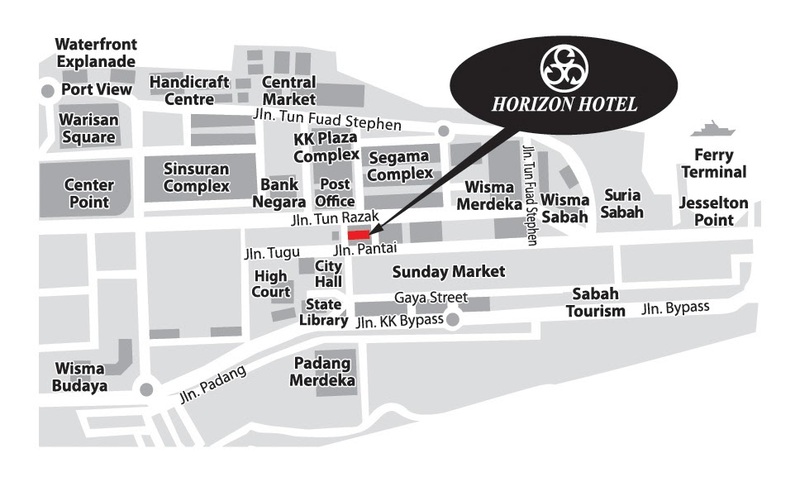 We are accessible via a 15-minute drive from Kota Kinabalu International Airport and Low Cost Carrier Terminal (LCCT). Centrally located in the city, we are right at Kota Kinabalu’s commercial, cultural, and historical pulse within footsteps of the City Hall and the famous Gaya Street. Major shopping malls, shops, eateries, and night entertainments are easily accessible by foot or public transportation. Public bus services departing from the Hotel area to Kota Kinabalu International Airport are available from 7.30 pm daily (schedule is subject to change according to service provider). Website by Neudimenxion | You are visitor no. 1961729 since Feb 2012.